Keyless Access is a locking and starting system that allows the vehicle to be locked or unlocked without using the key. It is only necessary for a valid vehicle key to be in the operating range of the vehicle and for one of the front door handle sensors to be touched, or the Volkswagen badge in the tailgate to be pressed . Keyless Entry: unlocks the vehicle via the sensor in the door handle on the driver or front passenger door or the Volkswagen badge on the tailgate. Keyless Go: allows you to start the engine and drive. To do this, there must be a valid vehicle key inside the vehicle, and the starter button must be pressed . Keyless Exit: locks the vehicle via the door handle sensor on the driver or front passenger door. The central locking system functions as with the normal unlocking and locking system. Only the control elements are different. The vehicle unlocking procedure is confirmed by all the turn signals flashing twice and the locking procedure by the turn signals flashing once. 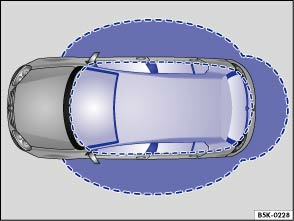 The vehicle will lock again within a few seconds of being unlocked if you do not open one of the doors or the tailgate. Grip the door handle on the driver or front passenger door. This makes contact with the unlocking surface . Touch the locking sensor on the outside of the driver or front passenger door handle once. The door being used must be closed. Touch the locking sensor on the outside of the driver or front passenger door handle once. The car is locked with the SAFELOCK mechanism active. The door being used must be closed. Touch the locking sensor Ⓑ (arrow) on the outside of the driver or front passenger door handle twice to lock the vehicle without activating the SAFELOCK mechanism . If the vehicle is locked, the tailgate will be unlocked automatically when you open it if a valid vehicle key is located within the operating range of the tailgate . Open and close the tailgate as normal . The tailgate is locked automatically after it is closed. This also applies if a valid vehicle key is located on the luggage compartment cover or in the luggage compartment. The vehicle is completely unlocked. A valid vehicle key is located near the front or rear seats in the vehicle. If a vehicle key is located inside the vehicle, the vehicle will only lock from the outside if a second valid vehicle key is located outside the vehicle, within the operating range of the Keyless Access system. If an exterior sensor in one of the door handles on a locked vehicle is activated more often than usual, e.g. if branches from a hedge rub against it, the proximity sensor will be switched off for a short time. OR: the vehicle is unlocked using the button on the vehicle key. OR: the tailgate is opened. OR: the vehicle is unlocked with the vehicle key. 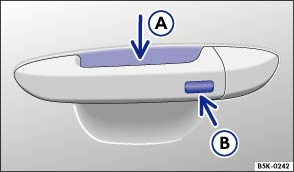 When the sensor on the door handle is touched, the door will open in accordance with the settings activated in the infotainment system using the button, and the and Opening and closing function buttons . It is possible that the sensors in the door handles will be activated by a powerful jet of water or steam if a valid vehicle key is within its operating range at the same time. It may not be possible to lock or unlock the vehicle using Keyless Access if the vehicle battery or battery in the vehicle key is weak or discharged. The vehicle can be locked or unlocked manually . If there is no valid vehicle key in the vehicle or if it is not detected, a corresponding display will be shown in the instrument cluster display. This may occur if the vehicle key is obstructed by another radio signal or is covered by another item, e.g. an aluminium suitcase or briefcase. The function of the door handle sensors may be limited by dirt, e.g. by salty deposits. Clean the vehicle as necessary . A vehicle with an automatic gearbox can only be locked if the selector lever is in position P.